play – for us today? 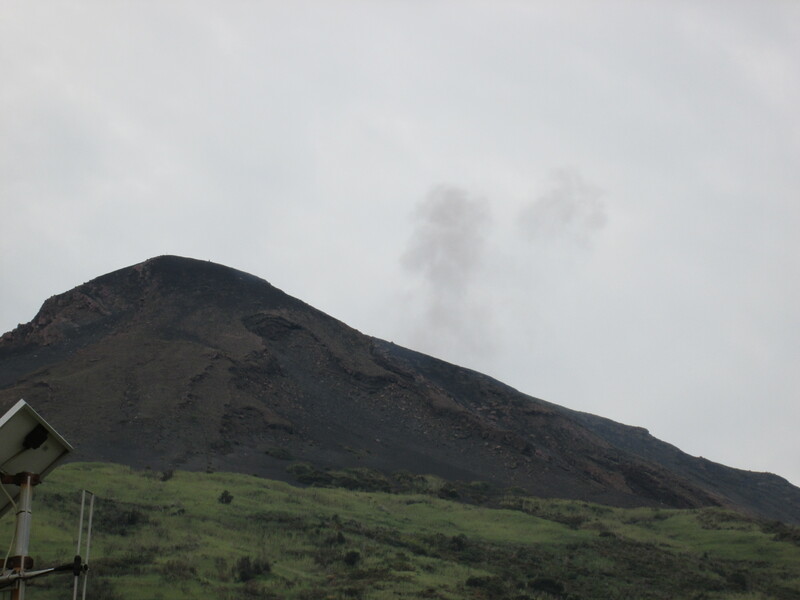 Thursday comes and at least we’ve seen the volcano. We go into Tropea, explore a bit more of the town, have a coffee, then park up and have an early lunch down by the port. 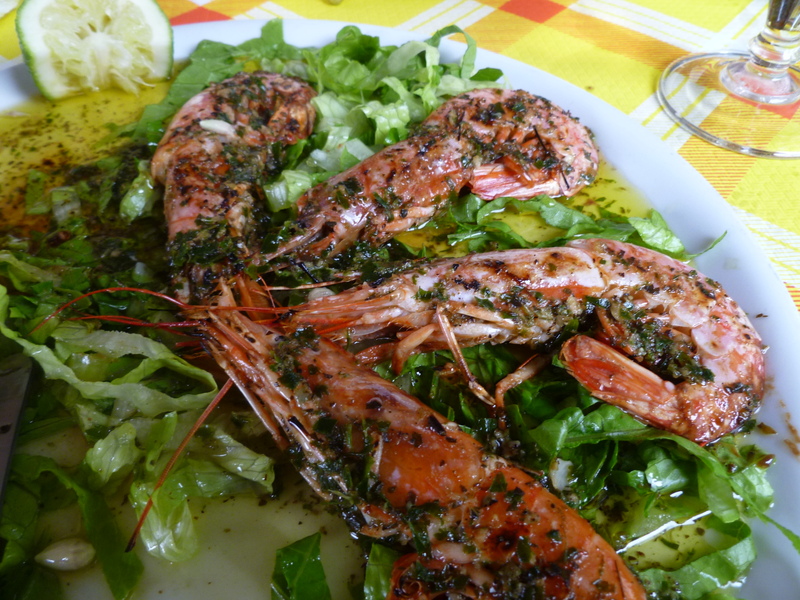 I choose ricciola a fish I’ve never heard of but am told is special to Sicily and Calabria. It’s texturally a bit like swordfish but with a sharper taste. In English it appears to go by the name of greater amberjack. Dee choose a plate of enormous prawns but even after her Japanese training declined to eat the heads. We leave and walk to the port to be told we have to re-park our car – in a paying area! It seemed fine to me where it was but the attendant was very insistent. We exchange our trip voucher for tickets with an additional unexplained charge of 3 euros and head for the TropeaMar which is to take us on our trip. There’s great confusion among the throngs on the quayside. The TropeaMar won’t start and we’re going on the Stromboli Express instead. 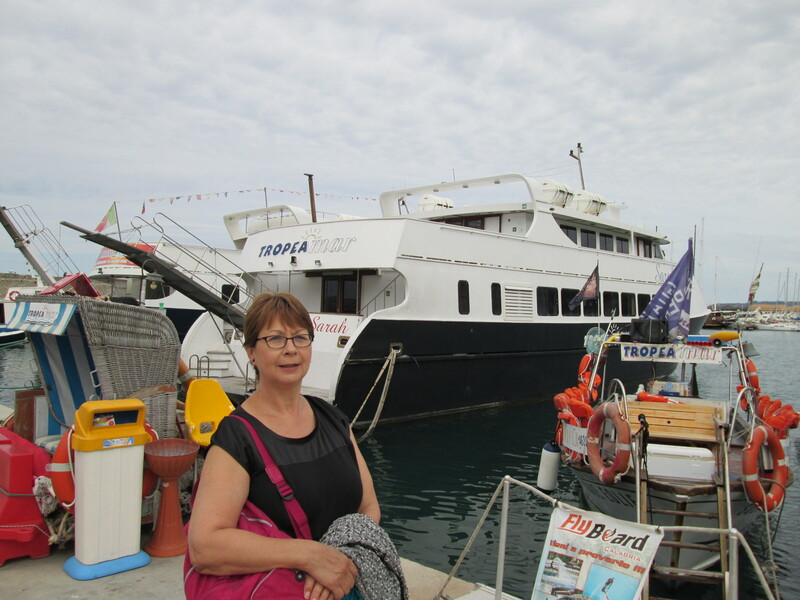 Tickets are exchanged and the Stromboli Express appears at the harbour entrance but there’s nowhere to berth her until some local boats have been moved. An almighty scrum to board takes places and eventually we set off at about 14:40. 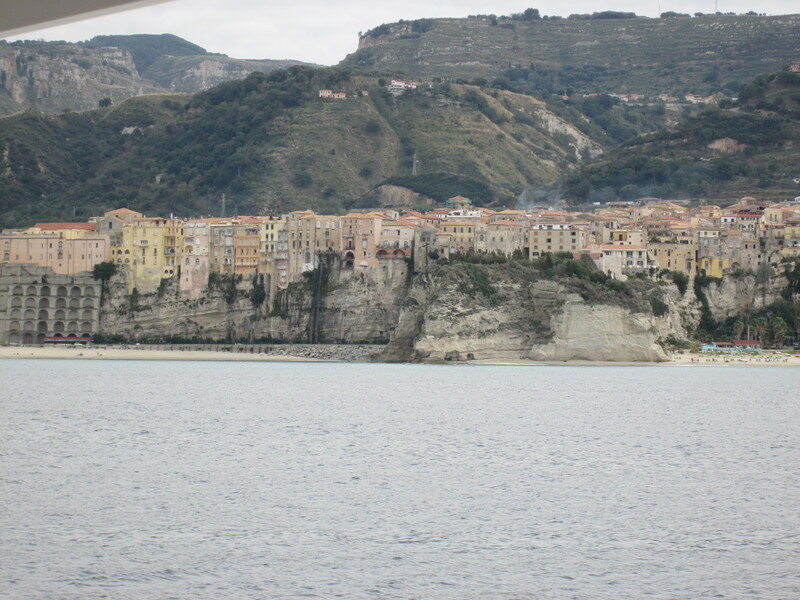 The view of Tropea up on its bluff is very fine as we leave the harbour. The weather’s a bit hazy so spotting Sicily and the other islands is a bit difficult. We looked carefully for the promised dolphins but they were obviously in hiding today. We even consult with the bridge but they can’t help. 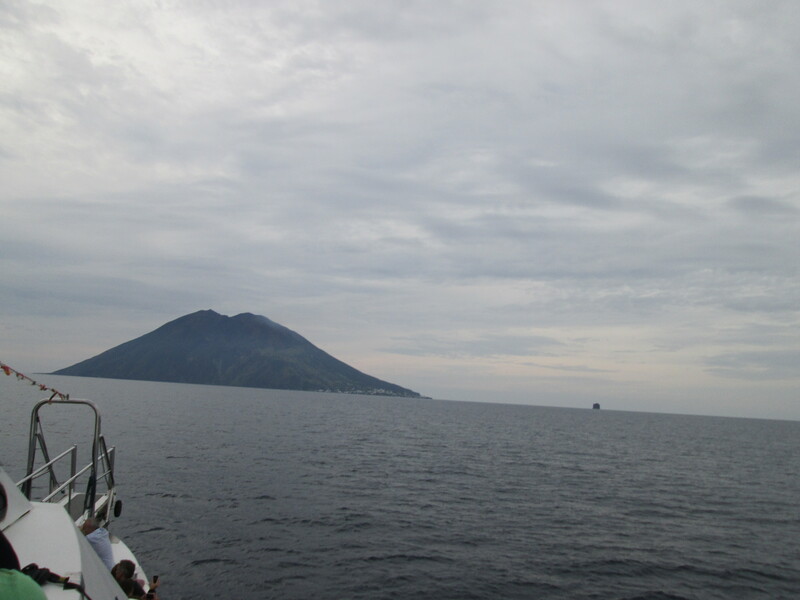 We can see Stromboli and its little rock Strombolicchio and Lipari and eventually Sicily. 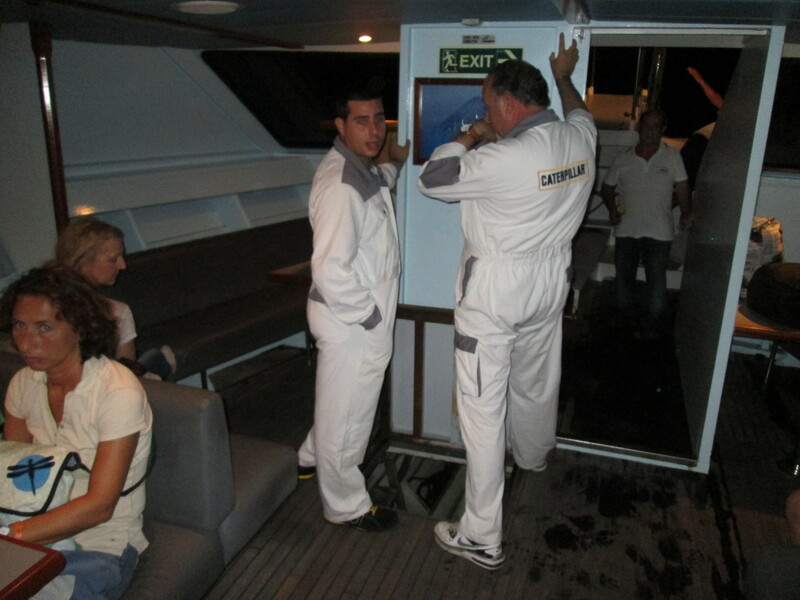 We arrive, disembark and are told to be back to the boat for departure sharp at 19:20. 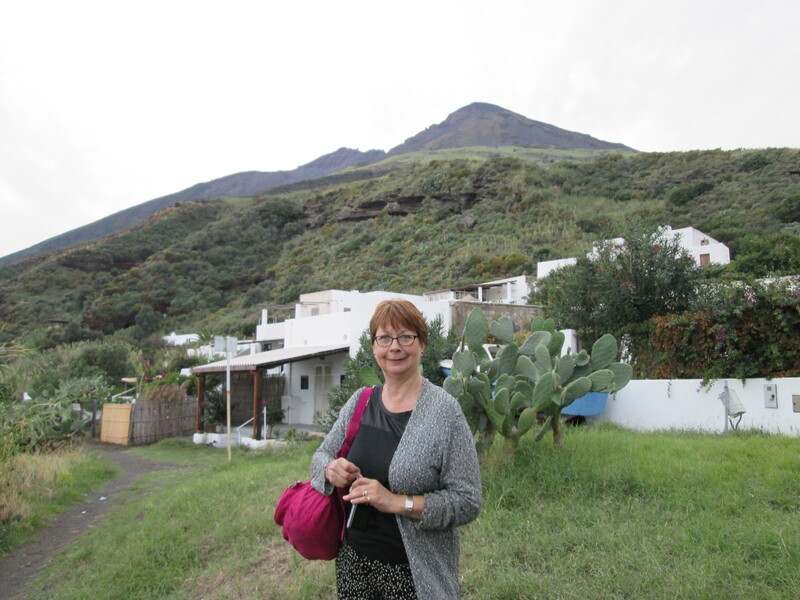 There’s not a lot to do on Stromboli unless you are a trekker-vulcanologist, but we did see a couple of puffs of smoke from the crater that augured well for the night ahead. The beaches are still something of a surprise being completely black – not sure I could do a day lying on a completely black beach. So wandered its narrow tourist-shop-lined streets, leaping to avoid the buzzing three wheelers that are the main form of transport along with golf buggies. We grabbed a beer and a snack before reporting back to the Stromboli Express as instructed. Some concern to find engineers with the engine room hatch up and the engine coughing like an old banger on a cold morning. 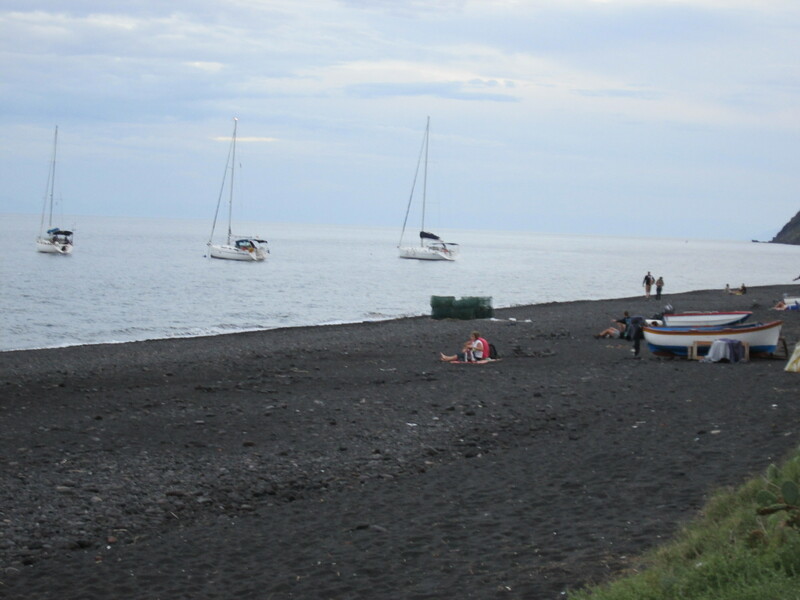 However we finally moved off and went round to the back of Stromboli to the optimum place to observe the fireworks. And we wait and we wait. We drift. We turn around and we drift back. Several other expectant boats share the waters. Eventually after an hour the captain apologises for Stromboli not performing tonight and we whizz back to Tropea at full speed. What we do see is an amazing electrical storm over the Calabrian coast with vast areas of cloud lit up by flashes of pink tinged lightning. 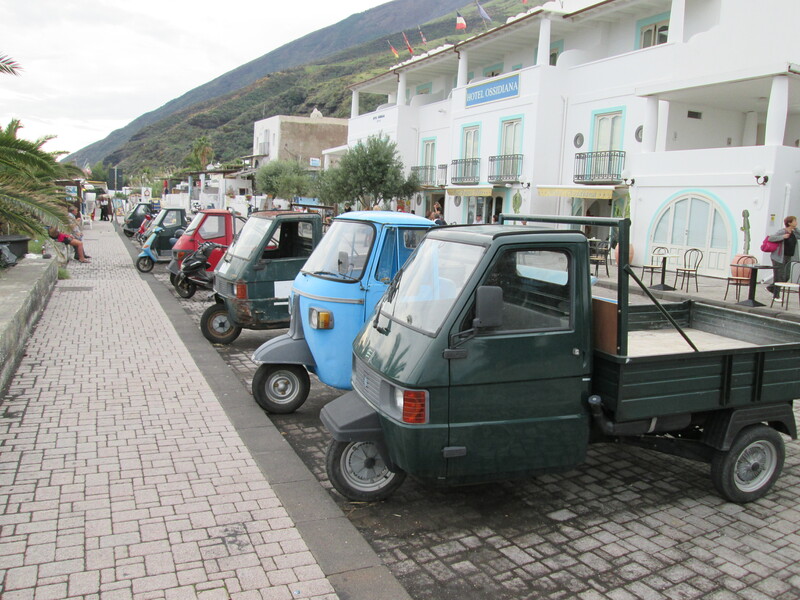 We couldn’t hear the thunder over the roar of the now full throttle engines – clearly desperate to get back before the curse of the TropeaMar stikes the Stromboli Express. Dolphins nil, Stromboli nil. But a fun and bracing day out on the sea wondering how our dear Captain Toddy is getting on in the tall ships race from Sydney to Auckland. Weather doesn’t look too clever down there either. Thanks. That’s a great post. massive amount work? I’ve no knowledge of coding however I had been hoping to start my own blog soon. Glad you enjoy the blog. It’s great fun to do and a lasting record of events that might otherwise start to slip from the memory. The fact that I haven’t posted for ages is down to lack of time and pressure to write material that pays me money! Wordpress where I blog has a huge range of easy-to-use templates so you don’t need to know anything about code writing – it’s just like writing a Word document. Good luck and enjoy!